Help us bring 10,000 Yoga Readiness Kits to active duty service members and their families. From our inception, one of Give Back Yoga’s primary focuses has been sharing yoga with veterans. 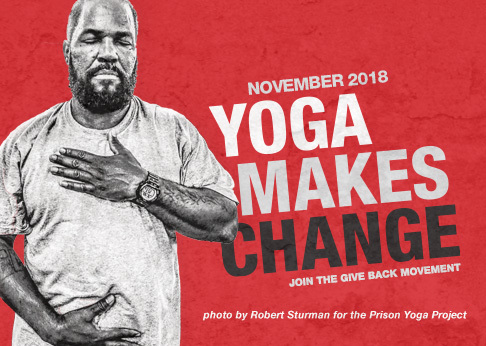 We are one of the few organizations supporting free yoga and meditation resources that can help veterans and their families to heal from the traumas they experience through deployment. To date, we have sent free resources to more than 20,000 veterans around the world. For a yogi, the mat is home base – a place to return to for grounding, clarity and peace. Through the support of corporate sponsor Gaiam, each Yoga Readiness Kit contains a mat, block and strap to support a service member in exploring a personal practice. Practice guides offer valuable step-by-step instruction for asana and meditation, as well as the context of each practice and why it works. Yoga Readiness Kits include a Mindful Yoga Therapy practice guide and Yoga for Warriors book, along with a Connected Warriors resource guide. Digital resources can be used at nearly any time, in any place. As part of each Yoga Readiness Kit, service members can access free online yoga classes and download breath work practices and guided meditations, while connecting with other service members who are exploring the gifts of yoga. Sharing the gift of yoga – a path to strength, resilience and inner peace in the face of chaos – is a powerful way to support our troops. For $75, you can sponsor a yoga readiness kit to be sent to an active duty service member. Any donation helps! The Yoga Readiness Initiative brings together a community of volunteers, yoga teachers, nonprofit organizations and other sponsors who are dedicated to bringing a personal yoga practice to members of the military, and their families. This collaboration is made possible by the generosity of Gaiam, and the loving work of the Give Back Yoga Foundation, Connected Warriors, Mindful Yoga Therapy, Sounds True and YogaGlo.